The most popular cake I make shouldn't even be called a cake, because it's incredibly dense and moist, more like a torte than a cake. It's chocolate cake with chocolate chips and chocolate icing, and has just made an appearance at the office potluck by request. It's the Darn Good Chocolate Cake from the Cake Mix Doctor, except I usually substitute fat free sour cream (or yogurt), and add more chocolate chips than the recipe calls for and drizzle with melted chocolate icing, because you can never have too much chocolate. It's not completely made from scratch, but no one ever complains. Drool, drool, drool! 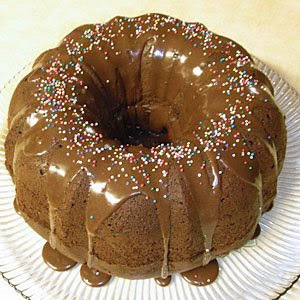 I love chocolate cake and that one looks wonderful! And that 'Rain and Shine' quilt is beautiful! I'm trying to contact you about the St Dunstan's blanket knitting - you kindly volunteered to make me some squares (or was it 1?!) Please e-mail me so I can send you my address. omg. it makes me drool. I do not bake a thing, oh, wait, I can bake precooked pizza. Looks scrumptious!